Thank You! Great seller! Highly recommend!! Good Quality in an Inexpensive Knife Set ! The set is thinner, smaller and has a flimsy feel to it. Also, not very sharp. Had I seen it in person, I would not have purchase it. This knife block set is pretty decent for the price, I noticed running them through the dishwasher put small rusty spots on them. 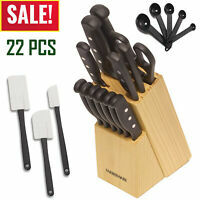 But the 8 Steak Knives are the $$$ aspect of the block, great for common use, and stays crazy sharp! Overall owned for 1 yr now, and it's not bad at all! I have waited for years to buy a new nice set of knifes, my last set was a wedding gift 29 years ago. I LOVE this knife set!!!!!! I wish I had, had the funds prior to this to buy this knife set. It is very sharp, fits the hand well, cleans up well and looks good in my kitchen. My best friend came over and she was all about where did you get these, how much were they... she thought they were sweet too. 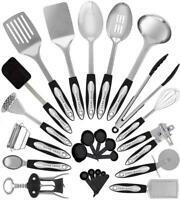 The knives and accessories are easy to use, knives very sharp. The stainless finishes are without flaws or defects. The handle on all the items are made to fit into your hand easily.. . Care must be used as all of the knives are extremely sharp. Holder is attractive and matches our countertops. My wife is extremely happy with this purchase. I also would recommend this as an ideal gift item that would be welcome in any kitchen.